Create a separate UI Canvas for your options menu, then save that whole object as your menu prefab. You can now instantiate this menu prefab into every game scene with minimal mess. 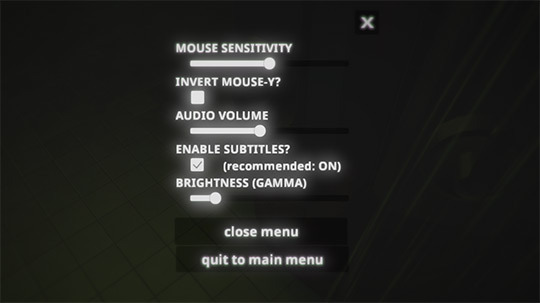 To pause in-game sounds, use AudioListener.pause = true; don't forget to unpause the sound if you exit the menu or change the current scene. To pause in-game action, use Time.timeScale = 0f; again, don't forget to reset it if you exit the menu or change the current scene. When detecting the user's screen resolution, be careful: Screen.currentResolution is the full screen resolution, but Screen.width and height is the actual window size. I would recommend letting the user change graphics quality only from the main menu, and not in the pause menu, since it's expensive to call QualitySettings.SetQualityLevel( ) sometimes. You can detect the user's OS language with Application.systemLanguage, but then you're kind of stuck with using Unity's SystemLanguage enum which doesn't have many options. If you are using PlayerPrefs, you can call PlayerPrefs.DeleteAll( ) to give the user the option to easily clear all their game data. If you're making something for Steam, the most used Unity wrapper is probably Riley Labrecque's Steamworks.NET here.